the special patterned glass for the clerestory. Might be worth contacting them if you do not have a local source. Avalon Rail inc. may have done / did the work. 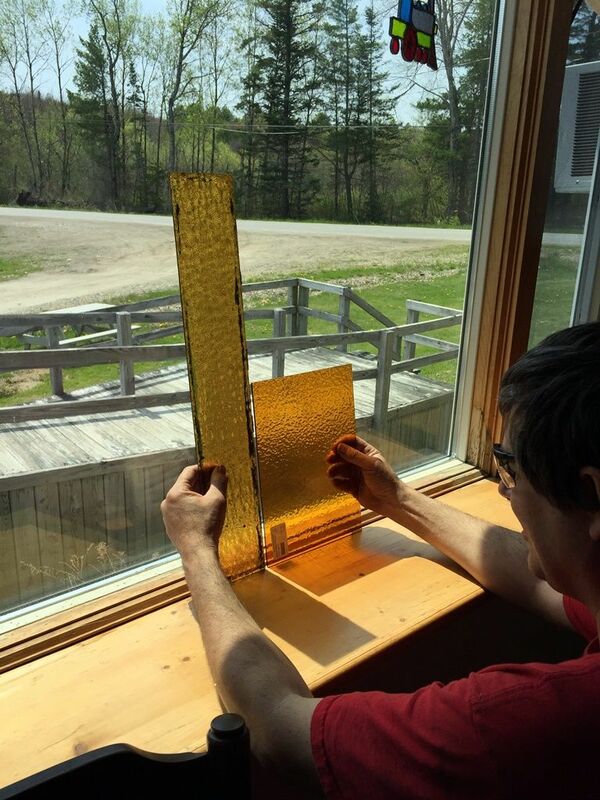 Many of the pressed glass patterns can be sourced through stained glass supply houses; older commercial glass houses also have a lot of specialty glass options available due to old home restorations and other architectural demands. Baltimore Streetcar Museum has used Chaudron Glass for years; I remember looking through books of glass samples when researching "ripple" glass for one of the streetcar restorations. I am working on seat reproductions for coach 9. I have one of the seats from coach 3 in my shop, and I am figuring out, among other things, how to make patterns to reproduce it. One of the first things I am doing, before stripping all the paint, is to determine what the original color of the seat frame may have been. They are currently black. The results are surprising. I am seeing unusual colors. But I don't know if the frames have ever been stripped to bare metal and repainted during their history, nor do I know what primers may have been used that may explain the colors I am seeing. Rather than reveal what I have so far, I will first ask the community if anyone knows of historical references to the seat frame color. The black and white builders photo from the Delaware public archives shows the seat frames to be quite bright, or very reflective. The seat arms definitely have some remaining nickel plating, but they are a separate part. The seats are made by Hale & Kilburn of Philadelphia. They are not the same seat that is being reproduced by Strasburg RR. It is a specific model for narrow gauge cars. Do we happen to have a copy of the order that was placed with Jackson & Sharp for Coaches 2 & 3? Possibly the colors for everything would be on either the order itself or on the order confirmation from J&S? I was just taking a look at #3's builders photo. I had no idea that the lettering and numbering on the car sides were originally shadow lettered. How cool! Also, if we don't have them, some order books for Jackson and Sharp are available from the Smithsonian. There are also some job books at the Hagley Museum in Wilmington in addition to photos there and in the state archives. If there is something to gain from it, I'm up for a little trip for researches sake. I did some research and found some glass for the clerestory. http://www.wissmachglass.com/textures.html scroll down to "Florentine 01" this stuff comes in different colors. if it is not an exact replacement only a skilled eye can tell without them being side by side. If we send them an original piece of glass they can match the color. 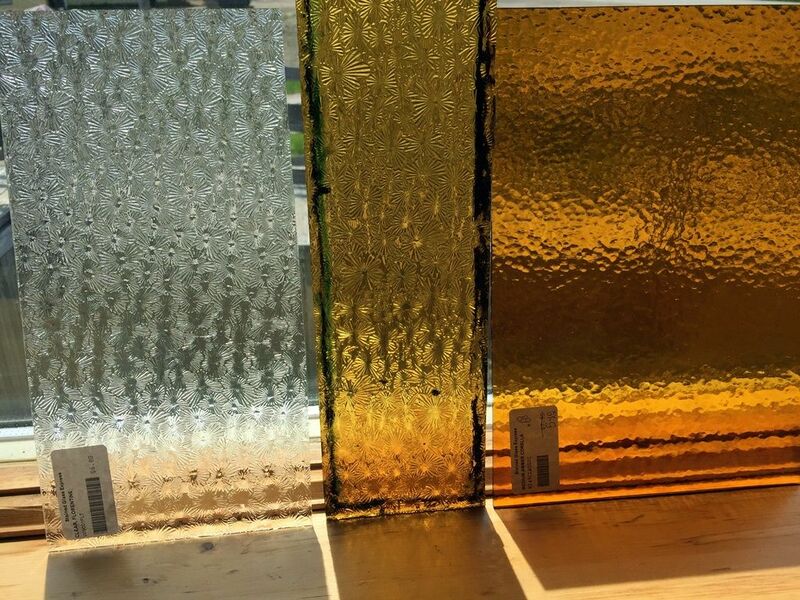 Glass samples for the clerestory windows. I believe that is an original window in Eric's left hand and between the two pieces of glass in the second picture. The left hand pattern looks to be a match. My own opinion, based on cars of a similar age at the Railroad Museum of Pennsylvania, is that both the glass in the center is not original. That type of glass was made in a press, which put the design in the glass while it was still hot. The sample on the right is more appropriate to the period. Given the ornateness of the car as built, and the constant dumbing down of the niceties thereafter, we've got every reason to believe the center piece, the long skinny one which we got from the car, is original. There are about 14 or 15 like it in the car; the others are clear plain panes, or plastic. Looking at the interior builders photo on the Delaware public archives, zooming in on those windows, shows a pattern. Obviously color and the exact pattern can't be discerned, but what circumstantial evidence we have supports our belief. I presume they were made by hot stamping colored glass in 1894, just as now. I got some more samples from the glass manufacturer and we are getting VERY close to the original color. The "Florentine" texture is also very close. The only noticeable difference seems to be that the new stuff has a button in the center of each rosette while the original does not. The rosettes are nearly the same size and character. I am getting two more color samples and should be really close. I'll get some prices and replace the plastic panels in coach 3 to see how it looks. I hope this is the right place to ask this question. If not; maybe someone can more it? I heard that a set of Jackson & Sharp passenger trucks are at the WW&F Museum. Why not use them under the new #9? The original passenger car was a J&S car. Just the wheel sets for a pair of new trucks will run into a lot of money. Maybe it is better to spend the money on the lumber. Perhaps I can offer a partial response to your query. While they are J&S trucks (actualy one is, at least in part, and Edaville reporduction), they are not the same as the trucks under Coach 3. So, even though they are J&S, they would not be the appropriate trucks for that car. Well, if that's the case.... If the Edaville "J&S" trucks are not going to be used under the new coach, they should be put under combine 8. Then the freight car trucks currently under combine 8 can be used under whatever the next freight car is. There's some sort of truck swap that will happen, or maybe it's just a wheel swap, or maybe wheels stay with cars and the truck bodies gets swapped. We went over it at the last board meeting and I didn't really get what was going to happen.